Are You Locked Out In Birmingham? Have You Lost Your Keys? Our trusted Birmingham locksmiths can unlock your door and get you back into your property. Our professional, uniformed and DBS checked Birmingham Locksmiths are available 24 hours a day throughout the West Midlands to attend all manner of locksmith work including repairing broken or damaged locks, gaining entry, home security surveys and more. We know that when you're locked out in Birmingham, or you've lost the keys to your home or office, you need a locksmith who can get to you fast and unlock your door. Our Birmingham Locksmiths live and work nearby and can get you back into your property without causing any needless damage to your locks, cylinders, handles or door frames. 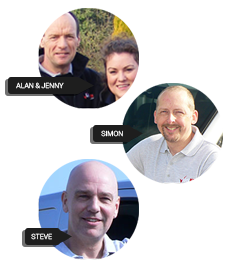 "Alan arrived last night as an emergency locksmith, my son had pulled the door shut behind him, with the keys on the other side. Alan was in in seconds, we were so happy to be back in our house." No need to panic! If you're in desperate need for a professional locksmith, we can help. We attend 1000's of emergency locksmith jobs in the West Midlands every year for people who have misplaced their keys and locked themselves out. We don't charge a call out fee and we could be with you in just 30 minutes* to unlock your door and let you back in. If you're finding it difficult to lock your door or you can't lock your door at all, it's possible that the lock may need repairing or replacing depending on the circumstance and the nature of the issue. Where possible, we will repair the lock rather than charging for a new one. In some instances a lock replacement cannot be avoided and will be the best solution. Our Birmingham Locksmiths live and work in the locality they serve or they live close enough for a short commute to you. This means our locksmiths can be with you quickly and it also means that you are using and supporting a local locksmith while having the reassurance of using a nationwide company. All of our Birmingham Locksmiths are DBS checked for your peace of mind. 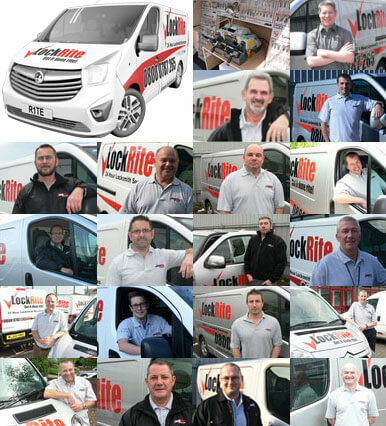 LockRite provide a 90 day guarantee on workmanship and all parts we use have a 12 months manufacturers guarantee. Our help desk team is able to take your calls 24/7. To discuss any queries call 0121 668 0009. There's several reasons why you might need new locks ; old locks can become difficult to lock with age, you may need to upgrade to British Standard locks to meet insurance requirements, others may have the keys to your home, or you may simply want an upgrade. If you need your locks replacing on your uPVC, Wooden or Composite doors, we can help. Our experienced locksmiths can give you their advice and let you know what's best for your circumstances. If you've been burgled and there's been damage to your locks, it's important to get a locksmith to repair damage where possible and make your home secure. We can repair or replace locks that have been tampered with. It's possible (depending on the entry point) that a burglar will take your keys on their way out and let themselves back in at a later date. we can also board damage caused to your windows and glass doors. If you've recently bought a new home or property in the Birmingham area, it's worth thinking about getting a lock smith to change your locks. Often, previous owners will have taken spare keys with them, or given some to family and friends to tend to the property whilst they've been away on holiday or have left the house un occupied for a number of days. Our West Midlands Locksmiths can provide a home security survey and give you advice on how to better secure your property to protect against burglaries and to meet Insurance Standards. 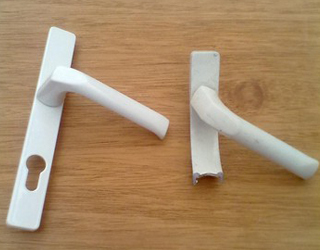 In 2013 a group of men were jailed for a spate of burglaries that involved snapping the lock cylinders of uPVC doors. Birmingham may not have the annual crime rate of some of the more notorious cities in the UK, but it’s by no means ranked well amongst other cities in the nation. To give an idea of the numbers, the Mirror’s database of crime statistics compiled for cities and towns across the UK ranks Birmingham in roughly the bottom third of all the communities it monitors. Another way of framing that statistic is to say that more than five out of every 100 residents in Birmingham fell victim to one of the crimes listed in the database over a six month period. These include everything from violent crime to theft and burglary – with a great deal in between. While Birmingham isn’t nearly as dangerous a place as, say, birmingham City or Manchester, it still has plenty of room for improvement. And even as the overall rate of burglaries in the greater Birmingham area has been decreasing recently, daily incidents are still part of the equation. With that in mind, it’s important to stay vigilant and to avoid being lulled into a false sense of security. And for a person who has become the victim of a burglary in Birmingham, telling them that the overall crime rate is in decline isn’t going to be much consolation. On the contrary, once a crime has affected your life in a personal way, theoretical statistics become more or less irrelevant. From November 2014 to December 2015, shoplifting and overall ‘anti-social behaviour’ constituted the majority of reported crime in Birmingham, according to UK Crime Stats. Burglaries made up a much smaller slice of the pie. But for those 114 property owners who reported a burglary during that period, the damage was real. Even in the event that nothing of significant value is stolen, the mere invasion of a burglary is unnerving. Knowing that a stranger has been in your own private space, rifling through your belongings and helping themselves to your possessions is off-putting – to say the least. Many who have been burgled find that the feeling of discomfort remains with them for some time, even after they’ve got over the financial fallout of replacing stolen or vandalised property. Needless to say, it’s preferable to make a point of securing your property with strong locks and other barriers to entry. One of the most common reasons that burglars select a particular residence to break in to is because they can see something like a smart phone, notebook computer, handbag or wallet through the window. This is low-hanging fruit, and it’s easily converted into quick cash on the streets. Make a point of storing your valuables out of sight – and well away from windows. Burglary and darkness go hand-in-hand. If neighbours can see a person breaking in to a property, they’re likely to call the police – or even head outside to confront the culprit. Exterior lighting or even strategically placed lights triggered by motion detectors significantly limit the space in which burglars can hide. It doesn’t matter how well built your fence or wall is. If the locks that secure it are in need of repair, a passing thieve will take notice. The same goes for garage doors, windows and any other potential entrances into the property. This is an easy factor to overlook. If your shrubs and hedges are overgrown, you’re leaving would-be burglars with convenient cover while they lurk on your property. Remember, anyone considering breaking in to your property is going to be encouraged if those living around you can’t really see what’s going on. Don’t believe for a minute that a thief is not going to look under the welcome mat or in other obvious hiding places for your spare key. By the same token, if you’ve recently lost a key, it’s best to assume that someone else may have found it. Change your locks and be done with it. Whether you’ve already been burgled, lost your keys or would simply like a second opinion on the security level of your home or office, don’t hesitate to contact LockRite. We’ll have a look at your property, replace your locks and – whenever possible – offer suggestions on how you can maintain more secure premises. All of our locksmiths are local, and that works to your advantage for a variety of reasons. To begin with, we can reach your property in 20 to 40 minutes to help remedy the situation and get your property back on the right path. Best of all, we’re available 24 hours a day. But being local also means that we know the neighbourhoods in and around Birmingham. We’ve responded to countless calls in the area, and we know when, where and how break-ins are likely to occur. Contact LockRite today to see how we can help. 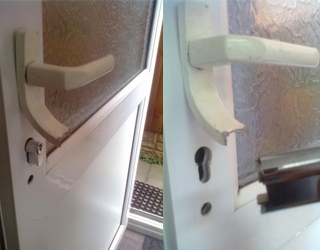 These photo's are taken from real jobs attended by one of our Birmingham locksmiths. What Is Lock Snapping and How Can It be Prevented? 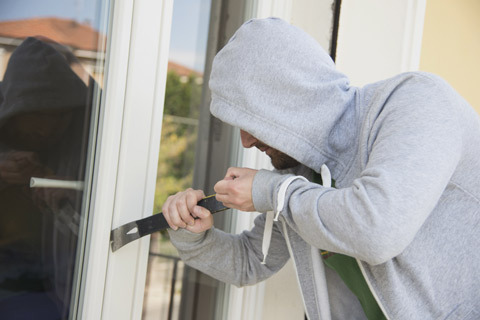 Lock Snapping is a relatively new technique used by burglars to break into homes around the country. The Birmingham Mail recently reported how a gang of burglars were jailed for a 'lock snapping' burglary spree in Birmingham. As this method requires brute force, the entry is destructive and will leave damage to the victims door, often requring the replacement of both the lock cylinder and handle. The perpetrator will attempt to gain access to the lock cylinder so they can snap it. If the lock cylinder is protruding from the handle it can make entry easier for the thief, if the cylinder is more difficult to get to, they're likely to rip the handle off of the door (see pictures). Once the lock cylinder is within easy reach, they will use force and a few non specialist, readily available tools to snap the lock cylinder and remove it from the door. Once the cylinder has been removed from the door, the burglar can easily gain access to the property. Videos online show this technique being used to break into homes in under 20 seconds. So how can you protect yourself against this sort of burglary? You shouldn't be frightened of lock snapping but you should be aware of the problem and the ways to protect against it. Ask one of our Birmingham locksmiths to take a look at your locks and let you know how you could improve your security. You should ensure that your lock cylinders do not protrude past the handle of your door, as this will make the life of a burglar much easier if they were to try to snap the lock. 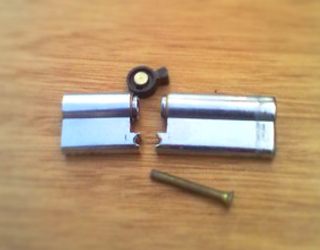 We can fit British Standard, Anti Snap locks to your doors to prevent this type of attack. If you're unsure about the security of your lock cylinders, contact us on 0121 668 0009. We carry out all forms of general locksmith work including gaining entry without unnecessary damage, securing properties after a burglary or break in (repairing damage to locks or replacing locks if needed, boarding of broken windows), general lock changes, key cutting if we're on site, and we can also provide security surveys to ensure your home is secure. We provide a 90 days guarantee on workmanship and 12 month manufacturers warranty on parts, giving you peace of mind. LockRite is CHAS accredited as well as ISO9001 registered which demonstrates we take our health & safety responsibilities seriously and have proven our ability to consistently provide products and services which meet customer and applicable statutory and regulatory requirements. Call us today on 0121 668 0009 for a free, no obligation quote.